Fabricio Coloccini doesn’t say much – but when he talks people do tend to listen. He’s even quiet out on the pitch. The captain is like a silent assassin. You don’t get much from him in any sense. Watch him closely during a game. He does speak, sometimes, but he seems to go about his business with his mouth shut, more or less. Very unlike most centre-halves who never stop talking. This isn’t to say the Argentinian doesn’t have any influence in the dressing room, because he is one of the club’s true leaders. There are more ways to make yourself heard and respected than by ranting and raving. Anyone can do that. Most people in football do. Maybe it’s because the guy is happy to pick and choose his words they mean more than if they came from another team-mate. Coloccini also doesn’t like to do the press. When he does, the guy is beyond polite and an interesting guy to talk to. It’s just he would rather do his stuff, if not under the radar – he is the captain of Newcastle United after all – but with as little spotlight upon him as is possible. Things, however, will have to change. Alan Pardew (left) wants to see Coloccini step up in these three games, starting at Fulham today, when the manager will be elsewhere. John Carver is going to need some help. The most experienced player in the dressing room has been asked to fulfil the role of player/captain/assistant manager. Pardew said: “I might have two experiments in terms of dealing with the team a little bit differently. “One of them is to say to Colo he needs to take a bit more of an active role in the next three games. “He can express his opinion at half-time when my opinion won’t be there. “The players can offer John some assistance and make life a little bit easier for him, which when you all buy into that can work. Colo will find his own way. He is not the type of person to do some Churchillian speech. That is not his way. Coloccini has clearly taken the hint. This week, and this is unlike him, he has put his head over the parapet to back his manager. What the players really think of Pardew and what he did a fortnight ago will remain unknown. At least until the autobiography is written. That will make a good read. Coloccini became the first to speak out properly on behalf of the squad and his boss would have been happy to hear what he had to say. The 32-year-old Argentina international said: “Of course we are behind him. He’s the manager and he is like our team-mate. The players and the club support him. “He knows what he did. It’s finished. All of us can do something wrong. Carver has been here before. He was in charge for a game, a 3-0 Premier League victory over Blackburn Rovers as caretaker manager in September 2004. Coloccini has trust in the Geordie, a man whose passion and love for Newcastle United no one could question. He added: “John is an experienced man. He was here for the best years when Sir Bobby Robson was here. It’s nothing new for him. He has all of our help.” This should be a straight-forward enough day. Fulham are a mess. They are three points adrift at the foot of the table and have taken just two points from their last nine game. 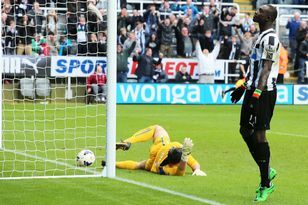 Newcastle are looking for a third successive win and an eighth away victory of the season, which is a terrific record. They only won one away league game last season – against already relegated QPR. Yet there is no Loic Remy and no Mathieu Debuchy and even Hatem Ben Arfa is missing, although his role would most likely be as a substitute. This makes things trickier than they would have been had injury not struck Pardew’s squad. So it’s a chance for Luuk de Jong to lead the line. One would imagine the Dutchman will start with Papiss Cisse on the bench. Fulham are in free-fall. Even with their problems, United should have more than enough to nudge their hosts closer to the Championship.